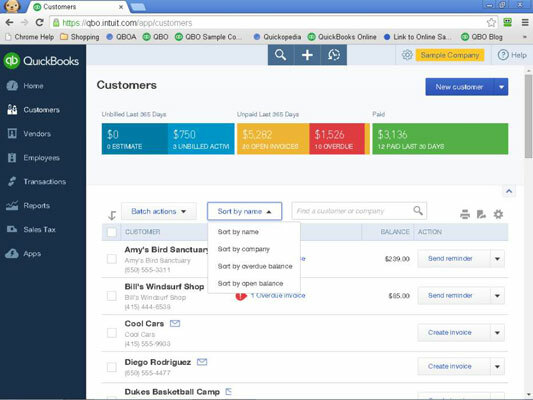 You can use the Customers, Vendors, and Employees pages in QuickBooks Online (QBO) in a variety of ways. For example, you can sort the people that appear in the list. You can sort the lists on the Customers and Vendors page by name, company, overdue balance, or open balance. By default, QBO sorts the entries on these pages by name. To change the sort order for either of these lists, click the Customers or Vendors link in the Navigation bar to display the appropriate page; for this example, I use the Customers page. Next, click the second button from the left just above the list; because QBO by default sorts the entries by name, the button’s default name is Sort by name. But, when you make a selection from the list that appears, QBO not only sorts the list in the order you select; it also changes the button’s name to reflect the selected sort order. Once you turn on payroll, you can sort the employees that appear in the payroll list by clicking a column heading. 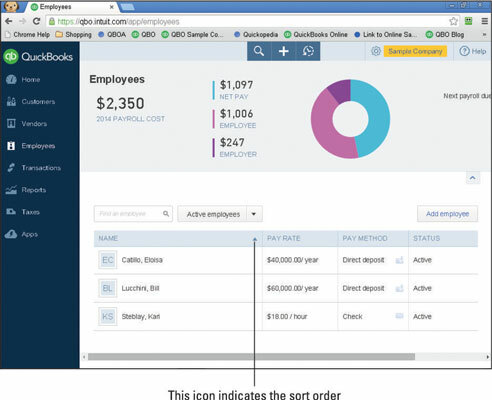 By default, QBO sorts employees by name, but, to sort by pay rate, for example, click the Pay Rate label in the list of employees. You can identify the column by which employees are sorted by looking for the arrow beside the label. An upward-pointing arrow indicates sorting from lowest to highest; clicking the same column again sorts the list in that column from highest to lowest. Here, employees are sorted alphabetically by name.